community on Sunday, Dec. 21. Organization chief Yasir Arafat reportedly made by Sen.
spokesman, told reporters last Friday. then referred it to the FBI." that he met last week with Sen. Charles Percy (R., Ill.
by Palestine Liberation Organization chief Yasir Arafat. m the press, with Soviet President Leonid Brezhnev. money and wealth of the world." Protocols of the Elders ofZion. been ruled out of order." Hoger Mi A lighting the first candle. Students from Hillel School were charming, as always. in i)r. Zielonka"s article. Mr.
"they're doing it, why can't we"
you so justly deserve and earned. disagree most violently with Sen.
Jews and the Jewish people. of Israel. She was introduced u.
the United Jewish Appeal, and! family life in the sunbelt. , md "ho ho ho"ing until the 25th. So what's a Jew to do? University of South Florida, Jan.
B'rith Hillel Foundation at USF. gogues of America, last week. INVITE THE WOMEN OF HILLSBOROUGH COUNTY TO . Daytime Session: 9:15 AM. 1.30 P-M- Evening Session: 6:00 PM. 9 30 P.M.
1. "IDENTIFYING SKILLS YOU HAVE DEVELOPED . 1- "JOB AND VOLUNTEER OPPORTUNITIES FOR WOMEN"
2 "FINANCIAL PLANNING/ INVESTMENTS, CREDIT "
Credit Bureau of Greater Tampa. Inc. Yes, I would like to attend the workshops on January 7,1981! 7:30 p .m. at the Jewish Community Center. any solicitation, without a minimum contribution. The Jewish Towers is in a Hot Spot. longer are capable of totally independent living. one would be offended. Often the Board waited at! find the Towers so fortunate. establishment of a "frail elderly" housing facility. Gardens Hebrew Home for the Aged in Jacksonville. adequately for all of its citizens. by PLO Chief Yasir Arafat. Publication Office: 130 N.E 6 St.. Miami, Kla nil! C Paid at Miami. FU. U8P8471 ! (Annual tj 50) Out of Town Upon R quest. and so the collection of in. our misery half a century hence. There is no better way to! their own level of despair. tions uttered in December, 1979? It seems to have been ft! for inaccuracy may be consistent. of his power. (What happened? |'r the poor and downtrodden. tiho can drive, cook and clean. others stood and fought for. In his "Notes on Virginia,"
private as well as public reasons. sity of Florida. Gainesville. Dec.
on Tuesday and Thursday at 7:30.
p.m., and Sundays at 11:30 a.m.
Hili Saul. Lionel Eluzory, Ann Hloxory, Francine I.eX'ine and Bruce I., Vine are shown in the home of Marshall and NaLeviiuon. campaign chairman in Montreal, and his wife were guests of the Kotlers. Doug Cohn. George Karpay, Rita Pearlman, Maureen Cohn and Bob be Karpay visiting before dinner. home of Marsh and Na l^evinson. paign has been most heartening. that will begin on Jan. 18. Attending the event were: Mr.
Mrs. Doug Cohn; Mr. and Mrs.
Stuart Golding: Mr. and Mrs.
Lawrence Falk; Mr. and Mrs.
Mr. and Mrs. M. W. Saul; Mr.
Mrs. Joel Karpay; Mr. and Mrs. I'uturvd with Mr. DuUin (centerj are Shirley Levinson, Montreal. Herbert treidman. fhairman. Pacesetter Division; Nelly* Friedman. Mrs. Esther Feldman of Miami and the late Dr. Frank Feldman. medical social worker for Tampa General Hospital. University of South Florida's Affiliated Hospitals. is her mother's alma mater. .. .
lilm to even be considered for this program. Hers was the jUtr. rightfully be bursting M the seams with pride! group. At this month's meeting they had a Chanukah theme. Frances Italiano. What a nice wav to get together socially! kively and delicious reception after the service were Gail Reiss. and commitment in their synagogues. and dances in a suit which illustrates all of the internal organs. miss out on this musical happening! daughter Shelly who was just married in August to Paul Divor. just recently been elected vice president of Ways and Means. Sholom and of SCHZFTY at Congregation Schaarai Zedek. chapter of the Jewish Civil Service Employees Organization. and have visited Alaska, Canada and much of the United States. i hat part of the world." dec-isions made or possibly made. will admit to being battered,"
without the help of an attorney. Women's Division Campaign Cabinet 9 to 10:30 a.m.
Executive Board 6 p.m. and Regular Board 7:30 p.m.
12:30 p.m. ORT (evening chapter) Bowling 9 p.m.
B'nai B'rith Youth Organization Regional Convention. 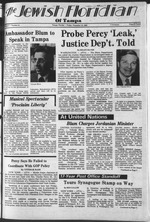 information regarding the Tampa Jewish Community. more to like about Tampa than just the weather!! Joseph to him, and Joseph's two sons, Ephraim and Manasseh. Joseph wept and took an oath to do his father's bidding. Then Jacob blessed Joseph by blessing Ephraim and Manasseh. your brothers in the blessing of our people." blessing to each of them. When Jacob died, Joseph and his brothers fulfilled his wish. land which He promised to Abraham, Isaac, and Jacob." 962-6338/9 Rabbi Leonard Rosenlhol Rabbi's Study, 12101 N.
Dale Mabry #1312 (Countrywood Apts.) Services: Friday, 8 p.m. Independent Day School, 1 2015 Orange Grove Dr.
Yakov Werde Services: Friday, 7.30 p.m. Saturday, 10 a.m.
r policy shaped by Exxon. |aod small matter to destroy her. jvc new world of megapolitics? sonian hardly stands a chance. in Europe during the Hitler era. lin trust of serious sceintists. country would be like by 1981.
stars and their crystal balls. 8777255 4802 W. Otborne Ave.
a summary of their content*. chief of state before he dies." with Yasir Arafat as its leader. to that held by most Americans. transition team for two reasons. attitude on a Palestinian state. on the nature of puch a state. border* and deal with the PLO. sition aides and on Capitol HiB. The Times said that Percy. newest talk in Tampa Wei! the feet to the knee of the dancer. Geneva be closed," the petition states. members of his congregation visit Israel annually. when the hearing dance onstage. side of the wood knocks). said deaf dancer Yola Rozinek. Naom Sheriff and Zvi Avner. the hearing and the deaf. Cooaaiwioa mi Md at law JitUCmMky Carter. Marl*. Blaklay, site if. 872-4461. Maao ..bract tocaaag*. Bread, Canned Pears, Coffee or Tea. Powdered Sugar Topping, Coffee or Tea. No lunch served Thursday or Friday this week. United States, sometimes resulting in deaths. foremost Jewish leaders from 13 countries. nors that will convene in Israel in February, 1981. Services in Lakewood, N. J.. Dec. 25 to 30.
ments of Music and Performance Studies. Horowitz, Artur Rubinstein and others. Majority on the democratic process in America,"
The announcement is made by Alexander I.
trustees meeting in San Francisco last month. around the world in 1961.
exhibit will continue until Mar. would remain in the museum. initially proposed in 1963 by Sen.
N.Y.; and the Touro Synagogue. Minister on his visit to the U.S.
been an improvement of late. political aftfe, Jean Claude Aime. early hours of Saturday, Dec. 6.
that it was a clear case of arson. to Middle East peace prospects. Israel "is indeed a strategic . also in Madrid at the same time.